Let’s face it, going into business premises that are grubby, tacky and uncomfortable does not make for good business. Neither customers nor clients are going to want to stay long if you create a bad impression. Likewise if a business premises is too hold or cold. Those first impressions really count. It is also important to give your staff a great place to work in. They might have to spend a long time working there. It will pay to make everyone as happy and relaxed as you can in your premises. Here are a few ways to go about improving that environment. Make sure that you have someone reliable and capable to come in and clean your premises. This should be done before the business starts early in the morning, or late at night when you have closed the door. Make sure that carpets are cleaned and that all surfaces are wiped down. Bins should be emptied and all rubbish cleared away. If you have toilet facilities how would you rate them? Make sure they are cleaned and checked during the day and that you have adequate supplies for hygiene products. Lighting is a major cause of discontent among workers and customers. If you have big overhead strip lights, replace them with more ambient and efficient versions. Have harsh lights adjusted and changed. Make sure that everyone can see well enough for their tasks and roles. It can be a good idea to consult staff on any changes. Colour matters and plays a big part in how we feel about our environment. Use colour schemes to create mood. Bright and brash colours may be too much. Use yellows, greens and reds in softer tones. Earth colours are relaxing. Blues are colder. White is neutral but can be a little soulless. 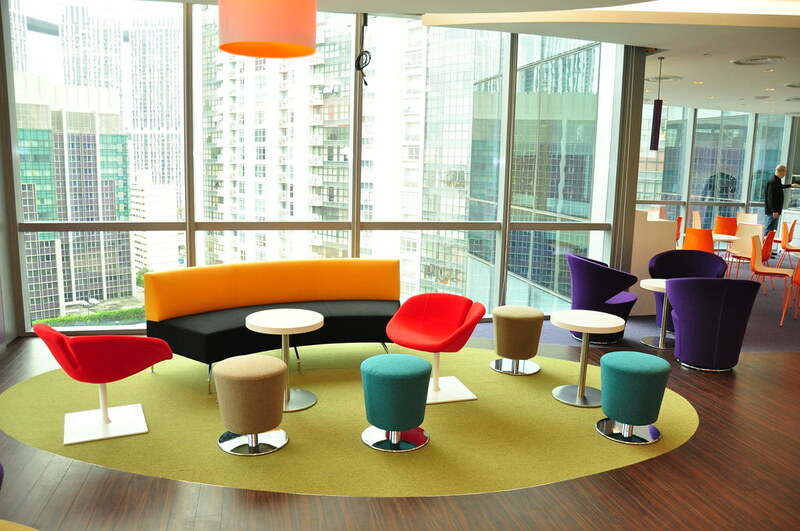 Try and work with calming and soothing colours that you like to be around. It is vital that a business sorts out an efficient and reliable heating and cooling system. Take a look at http://www.harsterheating.com/products/ for an idea of the best system for you. Get some advice. No one likes to be cold, and your customers are not going to stay around long if your air conditioning isn’t up to scratch. To play or not to play? There’s no hard and fast rule, but if you are running the same inane radio station all day, it can get a little tedious for staff and customers. Keep the volume at levels that will encourage conversation and even thought. No one should have to shout to be heard. Play music that is appropriate. Have somewhere to sit down and make it comfortable! There is no reason to invest in solid furniture that is not relaxing. There’s a good selection of office furniture at http://www.officefurniture.com/. Have a space for chilling out with access to water and magazines. Consider whether to invest in a coffee and tea making facility. Use plants to add some green and softness to harsh spaces. Create zen-like calm with a water feature or fountain. Going to work should be a pleasure and with a few changes, coming into your business will be that for customers, clients and staff alike.